They say it’s good to talk, and in our age of ‘chat’ and social media we might have dropped the ball on that. But on Time to Talk Day, talking takes on a special meaning. On this day we are all challenged to be more open about mental health issues and find ways of being able to talk about them. When we can’t talk about something, it grows in size, yet is buried in secrecy. And that isn’t just a burden that you carry yourself; if too much is kept private or secret in our communities and workplaces, when someone is struggling they feel more alone and bad, feeling everyone else is okay, even though research tells us again and again they all aren’t okay. So being open about how you might struggle with stress, anxiety or depression not only may lighten your load, but also help others. But talking can’t be to order, something you have to do; it might become something that you understand better and learn to do. At Good Thinking we realise that everyone is at a different stage in a journey, from feeling bad and not sure why, to doing the things that make those feelings better, or at least smaller. 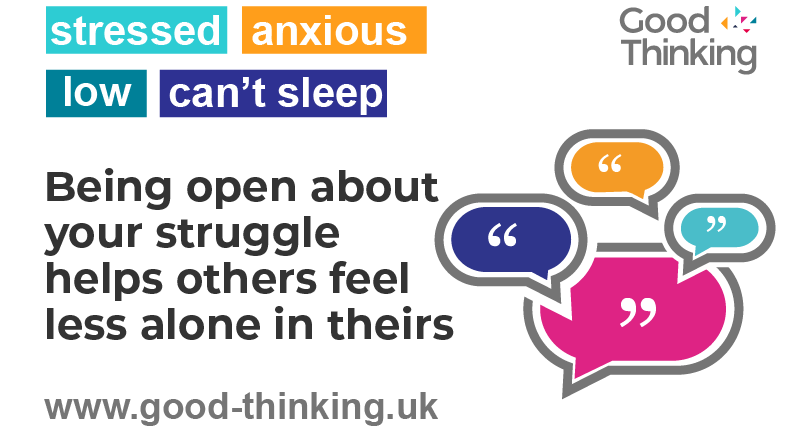 Our research told us that when someone is trying to make sense of what they are feeling, they are not ready to talk, but they are ready to listen. And they don’t just want to hear talk of diagnoses, medication or therapy; what helps is listening to or reading about how a mental health problem feels. They may want to understand that better, and so we provide a range of content, and a really comprehensive self-assessment. These might make more sense of those uncomfortable feelings, and perhaps help you see how you can change how you feel. Perhaps, towards the end of that journey, it is time to talk. Make the effort to phone people sometimes – it’s all too easy to get into the habit of only ever texting, messaging or emailing people. Imagine a gym, but for conversation…perhaps it is time to talk. Visit Good Thinking to explore tools and resources that can help you on your personal journey.